Any body else find these on there Note 4's? Has the ability to record audio and video without your conformation. anyone else paying attention to this stuff? And yet we pay a lot of money for these phones but we don't have the ability to uninstalling or disable this crap? And we're not supposed to root the phones and just accept apps like DT Ignite that has the ability to install apps without our consent? Makes me want to either root the phone our just sell it and get an old flip phone. palandri, felloffthetruck, nikkisharif and 3 others like this. That's pretty crazy that you can't turn it off. Sound detectors: Building on the ... interesting addition of a "Baby crying detector" on the Galaxy S5, the Note 4 also includes a "Doorbell detector" that will notify your attached Samsung Gear smartwatch when a doorbell is heard by your phone. To make this work, simply place your phone within 10 feet of your doorbell, presumably in a place that isn't necessarily filled with ambient noise. When the phone detects that the doorbell has rung, you'll be notified. Turning on Doorbell detector disables any S Voice or Google Now always listening features you may have enabled. jsgiv and UniQue WerkX like this. I am now intrigued and will look into this on mine when I get a chance. palandri and UniQue WerkX like this. It really doesn't seem like a legal application you could load on a phone that you can't turn off. If you can't get a legitimate answer on this application, I would take it the FCC and see what they have to say about it. I've never noticed or seen any of those icons in my old S5. I would definitely consider doing a factory reset and see if they still appear. They look highly suspicious. Any body else find these on there Note 4's? anyone else paying attention to this stuff? And yet we pay a lot of money for these phones but we don't have the ability to uninstalling or disable this crap? And we're not supposed to root the phones and just accept apps like DT Ignite that has the ability to install apps without our consent? I did find the DT Ignite a few months ago when setting up and deleting what I didn't want. I turned that off. palandri, UniQue WerkX and SscoootzZ like this. It's just Google spying on everyone and nobody knows it. Root your phone assuming you are on a carrier where that is possible. I just looked this up in settings, then opened up Titanium Back up, backed it up, then froze it. I will keep an eye out to see if anything I use regularly has been affected by it being disabled. Just in time for the tin foil hat business I was starting.. Excellent. plumcrazy, PlanetPluto7 and rzcl like this. Just this morning I woke up with 4 new apps installed on my phone without my knowledge. Cookie Jam, Panda Pop, Uber and Clean Master. What can I do to prevent this? It must have been this thread. That app is a back door that the carriers can use to install any app without permission. They use it to install apps so they get a kickback from vendors. Where can I get one of those tin foil hats. I prefer tin, the new aluminum ones don't work as well. felloffthetruck, mayconvert, peacefulberry and 1 others like this. What were the last apps you installed? That app is a back door for the phone provider to let them sneak in apps without you knowing. I believe that I do have it disabled. I'll have to check it again. I have not installed any new apps in quite some time. All of those apps will be there even if you do a factory reset. I saw them and also did a factory reset and they come right back. That DT Ignite needs to be disabled as well. It allows carriers to install anything they want. DT Ignite installs cookie jam, pandapop, etc delete / disable all those. This has been one of my complaints about the samsung line of phones. They do crap like this more than Any other vendor. Insane! As much as the Note 4/Edge costs, this should definitely be an option! When did you get the phone? They were optional for me. 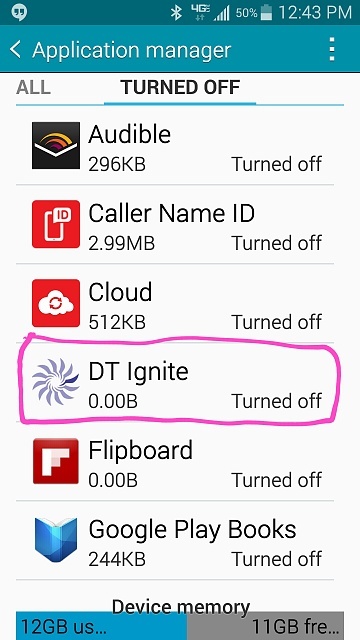 They are "gifts" from Samsung for purchasing the phone and DT Ignite does install them, but once I deleted them they have not come back and I have not "turned off" DT Ignite. If you don't want to use DT Ignite simply "turn it off" in Application Manager, clear the phone's cache, and you are good to go. You can also go into the APP STORE under My Apps and remove the unwanted apps from your list. Without an app on your personal list it shouldn't ever be automatically re-installed. If I had a Note 4 I would take this issue up with the FCC because a common lay person wouldn't know how to turn it off and from what I've read it allows the carrier to install whatever they want without your knowledge for a kickback. It's just Google spying on everyone and EVERYbody knows it. Let's actually put the blame where it belongs. It's not Samsung that's putting these apps on the phone, it's the Carriers. I'm on Sprint and I don't have DT Ignite, whereas we know at least T-Mobile phones do (no idea about AT&T or Verizon). While it may be 'fun' or 'cool' to blame Samsung for everything (and they do deserve some of it *coughTouchWizcough*), in this case, complaining about and to the party or parties actually at fault would be best. This is one of those cases where having the Carriers able to stick their fingers in the Android pie definitely doesn't work best for the customer. It's much less of an issue on iOS phones, because Apple doesn't really let the carriers (or anyone really) do anywhere near as much with the operating system as a whole. With Android being so open, not only do many manufacturers feel the need to muck around with stock Android, but then the carriers are able to add their own junk on top. monsieurms and UniQue WerkX like this. Why wont my phone display a message alert on my toolbar and cant give off a message alert tone?